Birmingham is a city filled with history, culture, and food. While we’re not complaining that new restaurants open around town all the time, it’s hard to choose where to eat when there are countless options right in front of you. But don’t worry! The Local is here to help you find the most authentic and trendiest spots to grab a bite the next time you’re looking to eat out. Original Gyro, Glory Bound Gyro Co.
Greek food in the South can be hard to come by, but Glory Bound Gyro Co. brings its Mediterranean twist right to Birmingham. Owners, Will Taylor and Chris McDonald, found inspiration for this Mediterranean-style restaurant while traveling in Greece. It’s been a hit since they opened the first Glory Bound in Hattiesburg, Mississippi in 2009. Glory Bound opened in downtown Birmingham during the summer of 2015 right along the new Rotary Trail corridor. The blend between Mediterranean dishes and American concepts create familiar recipes, and the open, light atmosphere draws customers in. “Our uniqueness in this kind of business really sets us apart,” said manager Parker Smith. So what should you get? If you are new to the gyro game, then the Original Gyro is for you. The lamb and beef filled tortilla is topped with lettuce, onions, and tzatziki sauce. The meat and sauce pair well together as you get a blend of both sweet and savory flavors, creating a simplistic taste that will leave you wanting more. 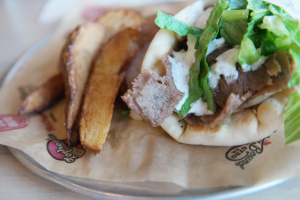 If you’re adventurous with your food, the award-winning Pepperjack Gyro is sure to call your name. Topped with bacon, pepper jack cheese, and comeback sauce, this gyro will surely never disappoint. Have you found a restaurant that you think we should try? Email us at hdiamond@samford.edu.